· Shopping and sightseeing opportunities. We will create a programme balancing knitting and sightseeing opportunities giving our guests as much choice as we can. The nearest international airport is Bengaluru International at Bangalore. Scheduled flights are offered by British Airways, Air France, Air India and a range of other international carriers. We will arrange for visitors to be picked up and driven to the Green Hotel from Bangalore. Friday 9th September to Sunday 18th September. Extra days/ two week packages can be arranged on application. The price of £895 per person (exclusive of flights and single room supplement) is applicable to either 8 day stay. The Chittaranjan Palace, built for Mysore’s princesses, has been lovingly restored as a small hotel. In extensive gardens, with formal lawns and shaded pergolas, and fringed by majestic trees, the hotel is an oasis of calm. It has been renovated and furnished using traditional Indian crafts. It offers comfortable surroundings, friendly staff, and a restful, creative atmosphere. The Green Hotel has been set up as a model of sustainable tourism: to preserve a historic building; to incorporate, wherever possible, energy saving and environmentally aware practices; to use Indian craft items in furnishing, equipment and restoration; to be a good employer, offering equal and fair opportunities; to train staff and develop their potential to provide visitors with the opportunity to enjoy traditional hospitality rather than modern day uniformity. All profits are distributed to charitable and environmental projects in India. Guests have the use of the whole of the former palace, including drawing rooms, a well-chosen library, and beautiful verandas.The gardens are large and provide peaceful relaxation. Because of the excellent weather in September we can spend most of the day in the garden, on the lawns. We do not have air-conditioned rooms, TV or generators because of our environmentally friendly policies. However the hotel is very airy and well ventilated, all the rooms have fans, and the temperatures in Mysore make air conditioning unnecessary for this time of year. We offer spacious, soothing lawns and shady trees to recline under. As part of this package, guests will be accommodated in Travellers Rooms. A single supplement of £100 is chargeable for single guests. These rooms are all with modern en-suite bathrooms. The hotel restaurant is open to non-residents. It offers a comprehensive range of vegetarian and non-vegetarian food. Special diets can be catered for. South and North Indian, European or Chinese meals can be taken in the garden, or on the veranda. Room service is available. Most guests choose to dine on the lawn, under the stars.All food is prepared from fresh ingredients produced locally where appropriate. The hotel is licensed and offers an eclectic range of Indian beers, and even Indian champagne. A favourite drink is fresh lime soda. All food and drink, excluding alcoholic beverages is included in the price of your stay. We are still in the process of planning all the knitting activities and will be announcing more over the coming weeks but just to whet your appetites, you may have seen on the Yarn Harlot’s blog that she was knitting wonderful, colourful and warm mittens straight from silk hankies. Our master dyer will help you create your own silk hankies using vegetable dying techniques then you will be supported, using an exclusively designed pattern in making some mitts or mittens of your own – a wonderful souvenir of your trip to keep you warm when you get back home.We will also be doing a session for those who would like to join in the trend for sock knitting but haven’t yet taken the plunge. You will knit a sock for a small child through which you will learn all the techniques that you need to take advantage of the hundreds of patterns for socks that are available.Always wanted to work with colour? Jane will show you some cunning techniques for adding colour to your knitting without holding two strands of yarn at once through slip stitch motifs then, for the brave will show you how to work double handed fair isle to make even the most complex colour work accessible. We will arrange excursions to the following attractions for you. They are not compulsory – if you have settled into your chair under a tree with your knitting, we won’t disturb you! It is up to you to choose the mix of knitting, relaxing and sightseeing that suits you. The market is the most popular attraction among our guests and is the perfect place to while away an afternoon. The much-photographed piles of colours used for decorating idols, the banana halls, the wonderful array of vegetables and above all the flowers make it one of India’s most attractive markets. You can buy jasmine marigolds by the pound and trays full of roses. The garland makers will string flowers while you wait. A real treat for the senses and a great opportunity to find inspiration for knitting projects to remind you of your trip. Built in 1912, the Palace is a triumph of Indo-Saracenic architecture. The finest ingredients such as Belgian stained glass, Minton tiles and cast iron from Glasgow combine to make this an extraordinary, lavishly carved building. The gallery is attached to the Palace. It has a very interesting collection of everything the Maharajah collected on his travels – from armour to French porcelain. There are interesting Indian paintings, particularly the Tanjore pieces, and the collection of carved ivory and jade is of world importance. There are 1000 steps to the top of the Chalmundi hill but it’s worth the climb to visit the 12th century temple at the top. Alternatively, get a taxi! The Nandi (statue of Shiva’s holy bull), which is half way up the hill, is the second largest in India. It was carved out of a single piece of granite in the 17th century. Venerated as a religious object, the bull is much garlanded with marigolds. The Maharajah’s summer palace built to house foreign guests, especially non-vegetarians, is now a hotel. A visit to Chalmundi Hill and the Nandi can be conveniently combined with a visit to the Lalitha Mahal. 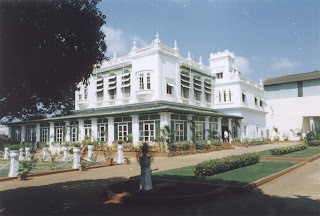 The road from the city centre to the Chalmundi Hill and Lalitha Mahal has many pretty old Mysorean buildings including the Police Band House, the Mysore Sports Club and the Turf Club. Not to be missed! This site includes the summer palace of Tipu Sultan, the Tiger of Mysore, who fought against British imperialism. The 18th century palace, with its wall paintings, and rich interiors set in formal gardens, is a real treat. While you are at Srirangapatnam take the opportunity to visit the Cauvery River. The Silk Factory Mysore is an important centre for silk spinning and weaving. The noise and hazards of working the machines bring alive history lessons about the Industrial Revolution, and make one appreciate the Factory Acts and Health and Safety legislation. Other than that, the silk factory has a great deal of charm and it is fascinating to see how the beautiful silk saris are made. The factory has a good shop selling silk by the metre (including furnishing fabrics). Saris are also available. Down the road there is a seconds shop. Look out for crepe de chine, and silk satin of unsurpassable quality, as well as the more usual silk chiffon and taffetas. The Craft Museum at the University Mysore has a very extensive university campus – just near the Green Hotel. In the midst of it is an interesting collection of carvings, baskets and photographs, put together by the Ethnography Department. There are also puppets – you’ll even find one of Mahatma Gandhi’s portable spinning wheels in a suitcase. The wooden boodai (wooden carved figures) are world famous and of supreme quality. The university also has a rare and wonderful collection of early scrolls and palm leaf books, and an exhibition of Mysore’s authors. These are only the tip of the iceberg. If you show a great deal of enthusiasm, other collections will probably be opened up to you! Generally the state shops, such as Priyadarshini or Cauvery, offer the best value. The service and display can be off-putting or carry its own charm, depending on one’s attitude. It has been said that for those employed in government jobs, the only task is to come to work, since they have virtual tenure. Occasionally one meets an enthusiast and that is both pleasurable and surprising. The lady at UP Handlooms is a treasure. Buying at state shops means the weavers and spinners have been paid the government wage. Cooptex is the Tamil Nadu Handloom Corporation. The Karnataka State shop has a very good selection of silk and cotton fabric by the metre, including raw silks in lustrous colours. The Haberdashery Shop in Deverarajah road is great for ribbons, braid and sequins. We are also commissioning an exclusive range of knitting accessories such as needle cases and project bags, made locally from sari silk as well as locally made knitting needles and hand spun yarns. You will have the opportunity to view and buy these items at your leisure at the hotel.